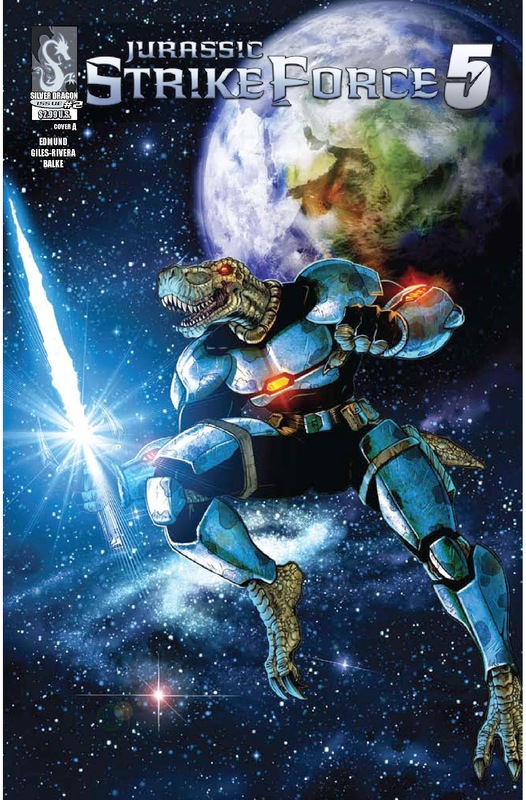 The Fellowship was fortunate enough to obtain a copy of JURASSIC STRIKE FORCE 5 #2 from Zenescope Entertainment. The story is by Joe Brusha, written by Neo Edmund with art by JL Giles-Rivera. To catch up, 100 million years ago, an alien overlord name Zalex came to Earth to find soldiers for his conquest of the universe. He did so by mutating the Jurassic reptiles that roamed the plane. Now flash forward to present day…an expedition group in the Antarctic not only awakens and frees Zalex and his army, but the Strike Force 5 as well. JURASSIC STRIKE FORCE 5 is a part of Zenescope Entertainment’s Silver Dragon All-Ages Imprint. The book is Jurassic Park meets Teenage Mutant Ninja Turtles meets G.I. Joe, and … did I detect some dialogue from The Empire Strikes Back? In addition, there are laser swords, laser whips, and laser guns. Overall, this was a lot of fun to read and I expect this series to be a hit for all ages. JURASSIC STRIKE FORCE 5 #2 is out in stores now or available at www.zenescope.com.